Within our cluster area, we have many highly trained healthcare professionals, and we encourage all patients to ensure they see the most appropriate person at the right time, thereby facilitating prompt assessment and treatment where required. Please click any image on this page for further NHS Wales Choose Well information, to learn more about seeing the right person, right time, whether that's A+E, GP, pharmacist, dentist, optician, nurses, NHS Direct Wales, or simple self-care. We have included several pages within the 'healthcare professionals' section, which help to outline the resources available and what they can offer. NHS Wales have launched a page outlining current wait times and patient numbers in various A+E departments across Cwm Taf. 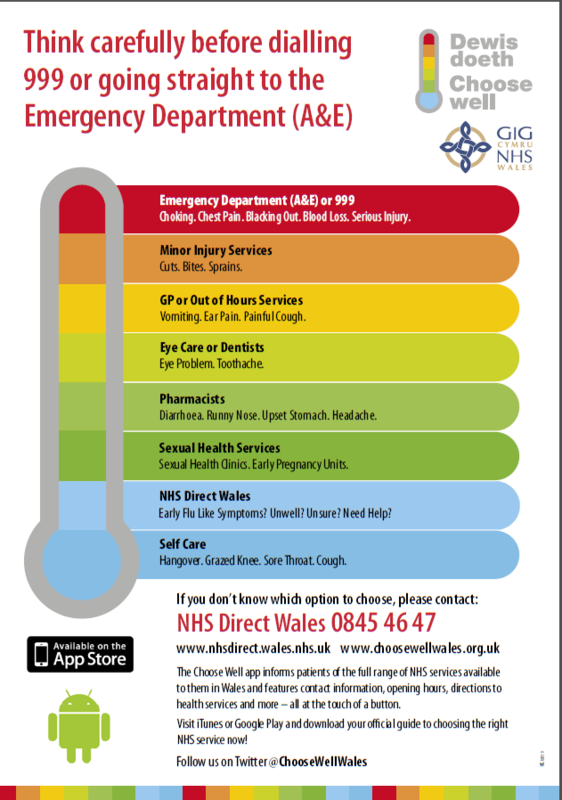 In our Taff Ely Cluster area, the Royal Glamorgan Hospital offers our local A+E services, and we ask that you check your symptoms are appropriate before attending there, and believe this tool will be helpful to understanding the pressures they are under, when you need to 'choose well'. From September 2018 we have supported the launch of the Care Navigation Service in all our Practices to help enable patients to see the right professional at the right time, click here for more info.